Quarry dust with a mix of particles, with sizes upto 12mm is used to build a biosand filter. We can also wash out the fine particles from quarry dust, or use it as is, with higher cement to aggregate ratio, to build the container for the water filter. The biosand filter is an innovation on traditional slow sand water filters (which have been used for community water treatment for hundreds of years CAWST 2009), specifically designed for intermittent or household use. The BSFs was developed by Dr. David Manz in the 1990s at University of Calgary, Canada. Decentralized, low cost and chemical free water treatment solutions, can reduce dependence on drinking water brought from elsewhere at high cost. Decentralization also makes the community, aware and protective of local water resources, such as springs, creeks, and ponds. Selecting and preparing the filtration sand and gravel is crucial for the treatment efficiency of the biosand filter. Crushed rock is the best type of filtration sand since it has less chance of being contaminated with pathogens or organic material. This sand also has less uniform sizing of the grains. A mixture of grain sizes is required for the proper functioning of the filter. Gravel pits or quarries are the best place to obtain crushed rock, and are common in most parts of the world. Steps: 1. The sand must be passed through the 12 mm (1/2") sieve, the 6 mm (1/4") sieve, the 1 mm (0.04") sieve, and the 0.7 mm (0.03") sieve, in that order. 2. Discard the material that does not pass through the 12 mm (1/2") sieve. 3. Store the material that is captured by the 6 mm (1/4") sieve � this is used for your drainage gravel layer. 4. Store the material that is captured by the 1 mm (0.04") sieve � this is used for your separating gravel layer. 5. Store the material that is captured by the 0.7 mm (0.03") sieve � A portion of this material is used to make the concrete filter box while the other portion is sieved further to make the filtration sand. 6. The material that passes through the 0.7 mm (0.03") sieve is the filtration sand that goes into your filter. If constructing concrete filters, this sand should NOT be mixed with cement because it is too fine and will not produce good quality concrete. The fine sand for filtration should be washed, but not fully. A certain amount of fine dust in the filtration layer is required for biological activity, that eliminates harmful pathogens. Also the fine sand filters out parasitic cysts. 5 cms of 6-12mm gravel is laid at the bottom of the container, then another 5 cms of 1-6mm gravel, and then about 40 cms of fine filtration sand is used. 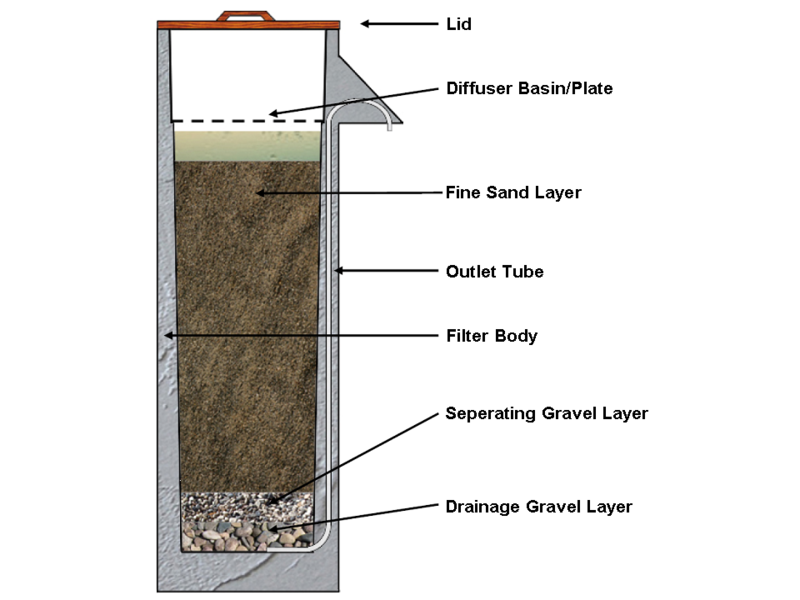 The container for the filter can be made with regular cement mortar, ferrocement, or even with fired clay that is a mixture of regular clay and rock dust. Ferrocement containers can be made thinner, 10mm or less in thickness. The steel mesh reinforcement makes it stronger.